Not to be confused with Sergeant Guy. General Guy is the leader of the Shy Guys and the mastermind responsible for the numerous robberies in Toad Town during the events of Chapter 4 in Paper Mario. His main base of operations is the Shy Guy's Toy Box, where he rules the local Shy Guys and is in turn very loyal to Bowser. His army obeys him without question and lauds them for their bravery, although his overconfidence in himself is proven unwarranted once he is defeated by Mario, leaving him screaming and fleeing in panic with the rest of the Shy Guys. He has a straightforward, formal and military-esque way of speaking in general, although at one point he childishly claims that Watt's attack is "too strong" and that Mario is cheating. He wears a peaked cap and gray robes decked with shoulder patches and a gold medal with a red ribbon on it. King Bowser orders General Guy and the Shy Guy Army to guard Muskular, the fourth Star Spirit. However, General Guy and his troops are very disorganized, which allows Mario and his partners to easily infiltrate his base and defeat many of his soldiers. 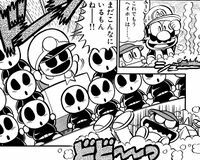 Later on, Mario manages to corner a large group of Shy Guys. They manage to escape by breaking through a wall where on the other side, they are reunited with General Guy. Soon after introducing himself, he prepares to battle Mario for the Star Spirit. Before battling General Guy, Mario must fight the Shy Squad, which has a max HP of 15. General Guy then summons two Stilt Guys, each one having a max HP of 7. After defeating them he summons two Shy Stacks that each have a max HP of 10. After defeating them, the player fights General Guy in his Toy Tank. The light bulb on his tank can release a bolt of electricity that can cause 5 points of damage and immobilize one of Mario's partners; however, the light bulb can be destroyed. Once the light bulb is destroyed, General Guy attacks by throwing bombs at Mario that can cause 4 points of damage. General Guy is defeated after another wave of attacks, and his tank falls apart. After his defeat, he flees with the rest of his Shy Guys. In the game's ending parade, General Guy and several Groove Guys dance on a float. 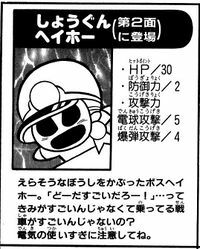 General Guy appears as a boss in volume 26 of Super Mario-Kun. Although Mario attempts to attack General Guy in a variety of ways (including cross-dressing of some sort, holding a bucket of paint and a paintbrush, and walking in something called "Ototo"), General Guy retaliates by electrocuting him. Watt, needing to be recharged, prompts Kooper to run on a treadmill. Once she is recharged, Watt zaps Mario, causing Mario to go crazy with a hammer and whack General Guy in the face. General Guy appears again in Super Smash Bros. Brawl as a Sticker that raises Launch Power by 31 points. Tattle This is General Guy in his tank. The tank seems to be dangerous even though it's a toy. Max HP: 30, Attack Power: 4, Defense Power: 2 Not only does the General give commands from the tank, but he also throws bombs and uses electric attacks. The power of his electric attack is 5, and your party member takes 2 damage points, so defend yourself carefully. He'll lose the electric attack if we break the light bulb. Normal fighting styles seem ineffective because the tank is well fortified. If the player combines the HP of the Shy Guy Army, General Guy, and the Light Bulb, this boss has 87 HP. That is the second highest in the game, with that first being tied between Bowser and the final form of The Master, both having 99 HP. General Guy and his army are the only boss to appear in the nighttime part of the parade during the credits. This page was last edited on February 8, 2019, at 21:07.